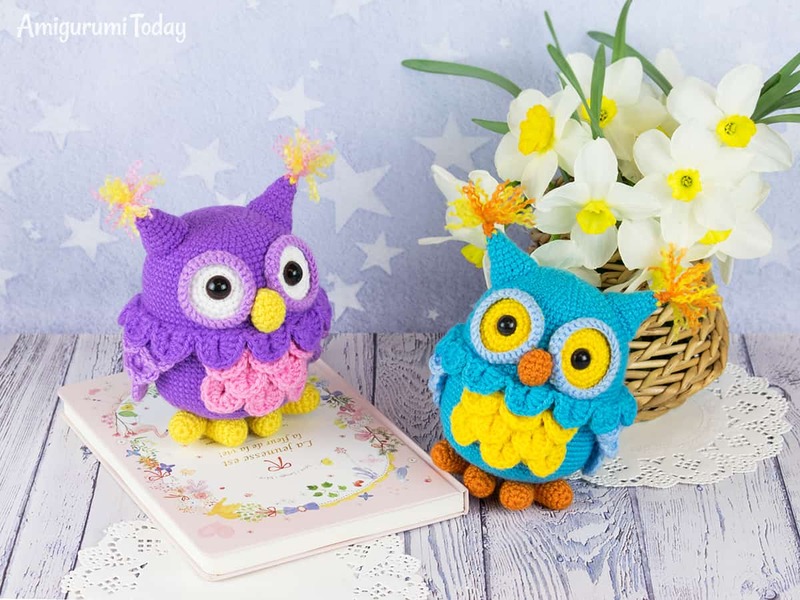 Crochet your own adorable owl with our easy-to-follow amigurumi pattern. 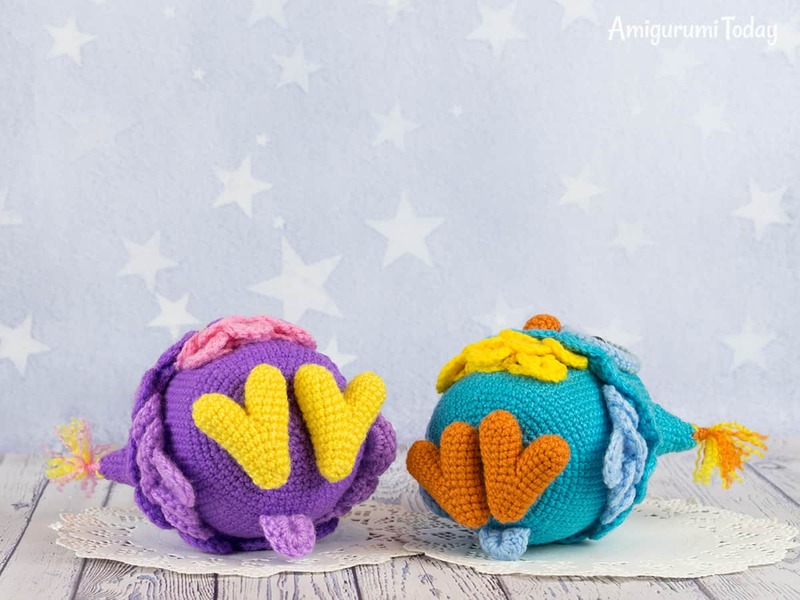 You can make even dozens of these squishy bundles of cuteness! 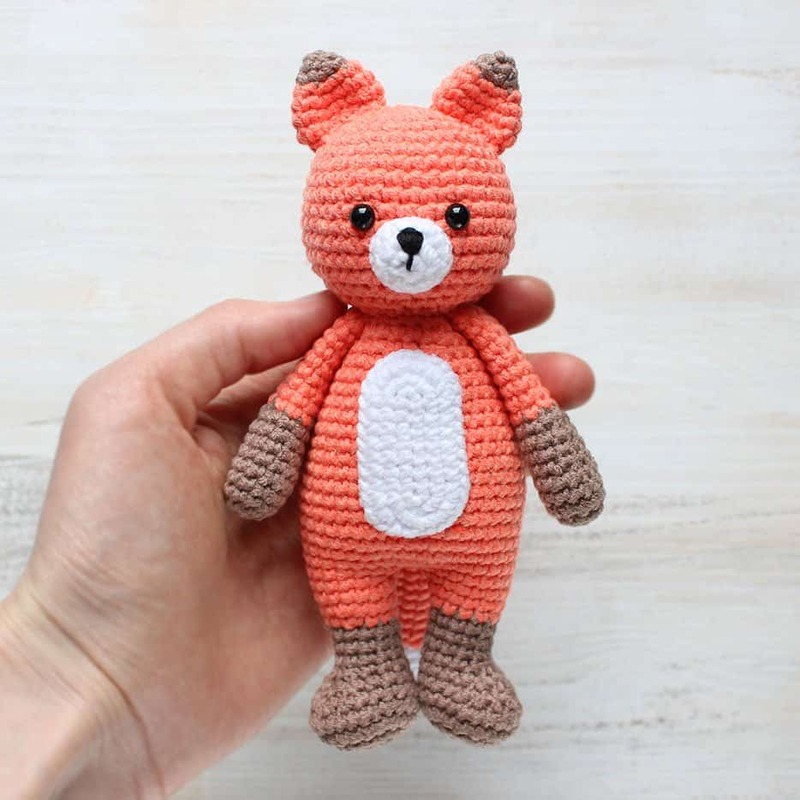 The look changes greatly with different yarn selections, so you will never get bored crocheting them. 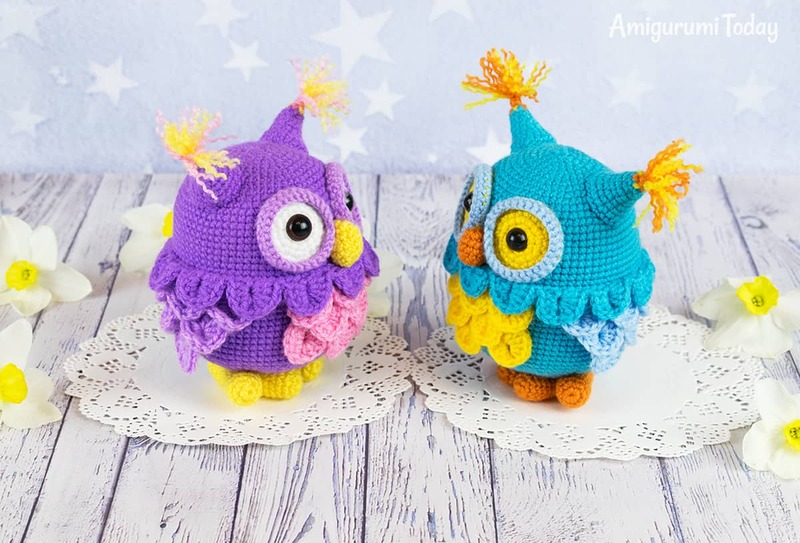 These amigurumi owls are very quick to make and so relaxing. 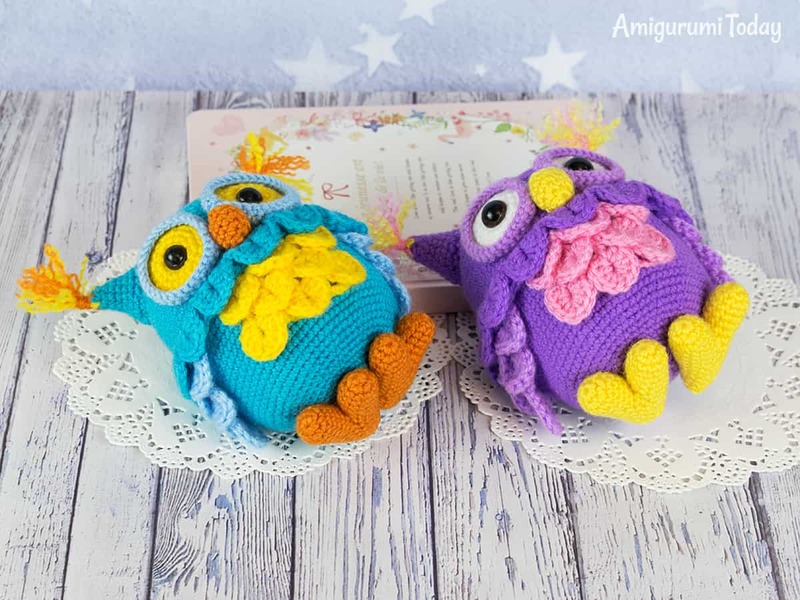 A pair of two crochet owls can make a cute gift for couples in love or newly-weds. There is plenty to love with their cuddly bodies and gentle feathers. 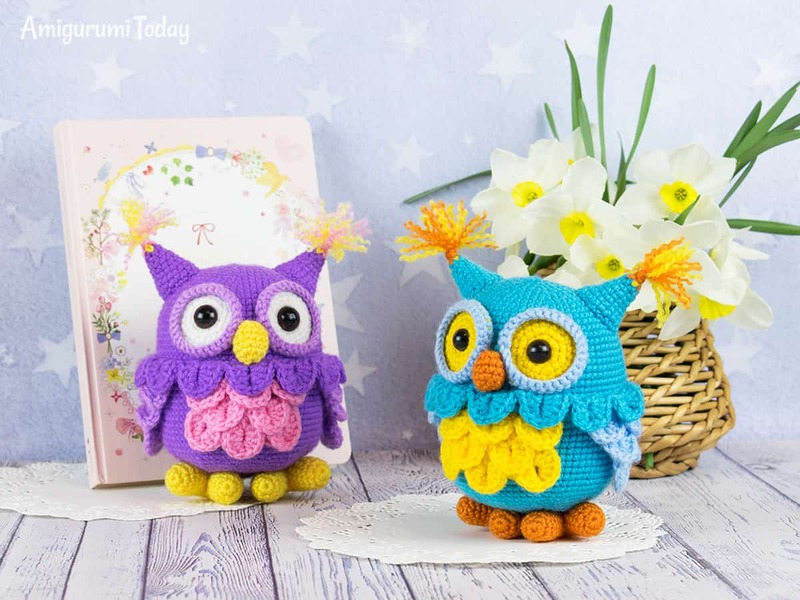 The size of finished crochet owl is about 12 cm (4.7″). 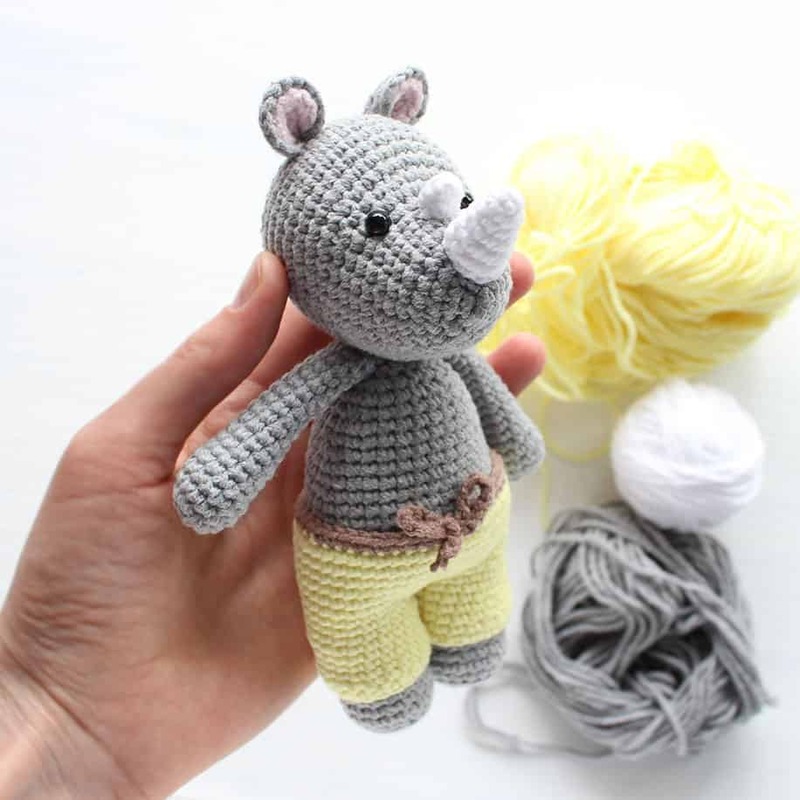 Please pay attention that the size of your toy depends on yarn weight and hook size. Please note that the colors of yarn for the blue owl are given in parentheses with an asterisk (*). Crochet with white (*yellow) yarn. 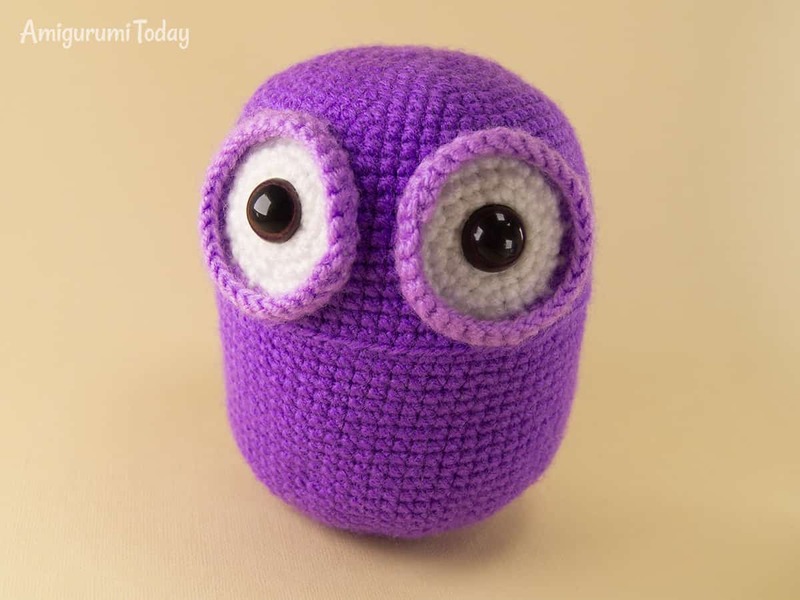 Change to light purple (light blue*) yarn. Rnd 6-7: sc in all 30 st. Finish with sl st. Fasten off and hide the tail. 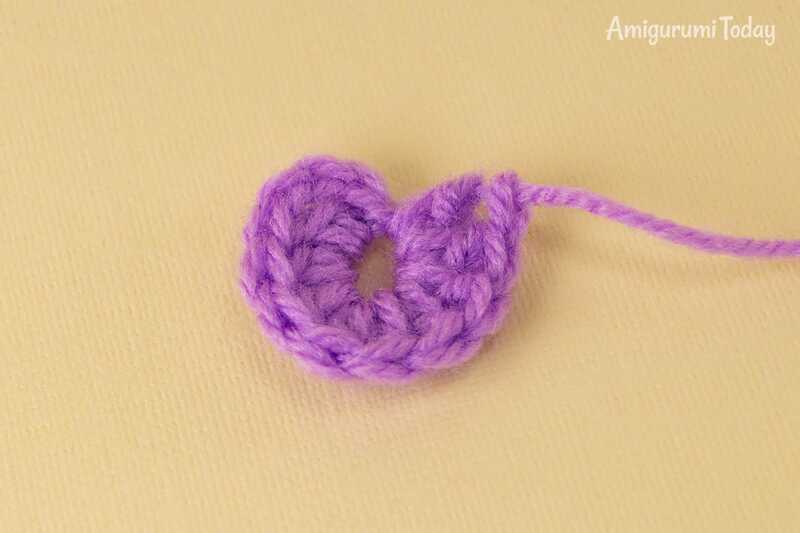 Crochet with purple (*blue) yarn. Sew the eyes between Rnds 11-21 at the distance of 2 st in between them. Insert safety eyes in the center of each one. 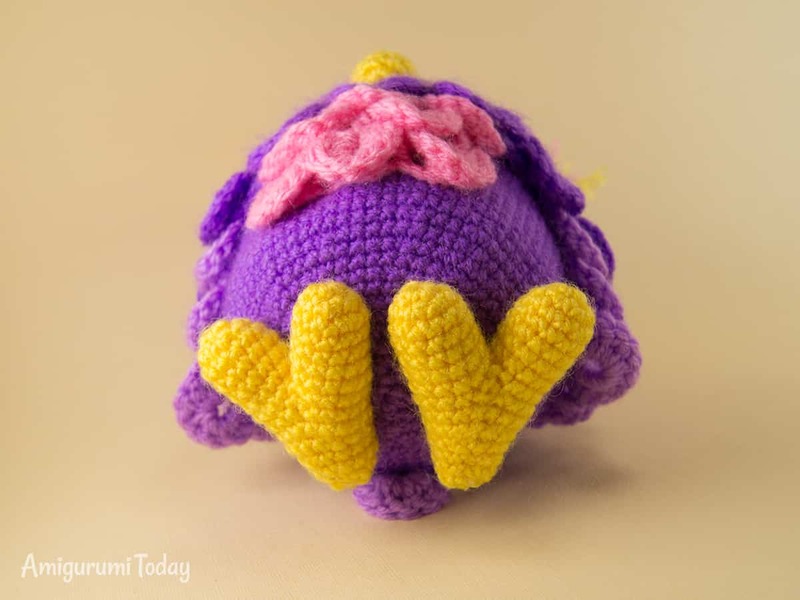 You can find a video tutorial on how to crochet chest feathers and wings on our Youtube channel. 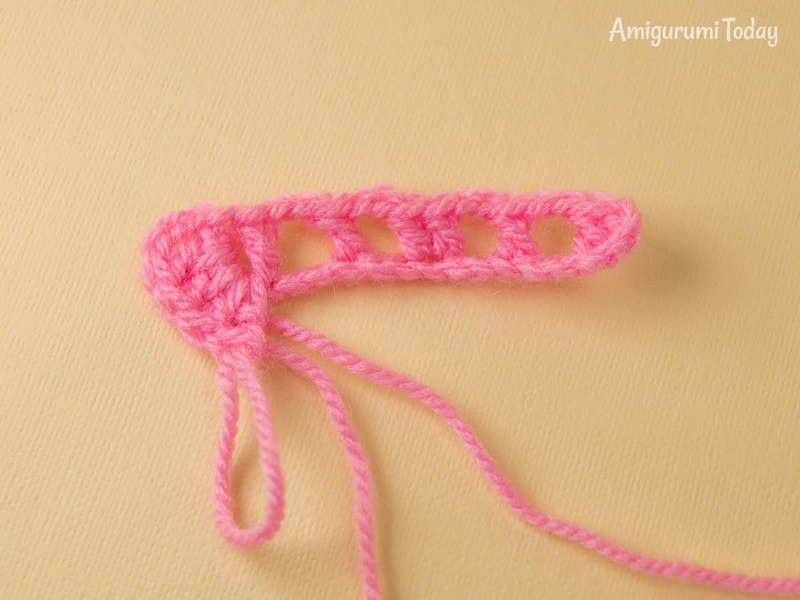 Crochet 16 ch with pink (*yellow) yarn. Row 1: dc in the 4th st from the hook, (2 ch, skip 2 st, dc in the 3rd st, 2 ch, skip 2 st, 2 dc in the 3rd st) repeat 2 times. Row 2: 3 ch (counted as dc st), start working into the first pair of dc sts, going around the post of the first dc of the pair as if to work a back post stitch: make 4 dc around the post of the dc st, working down the length of the post towards the foundation chain; turn and make 5 dc around the post of the next dc st, working from the foundation chain end towards the top. Sl st in the next single dc. The first feather is done. 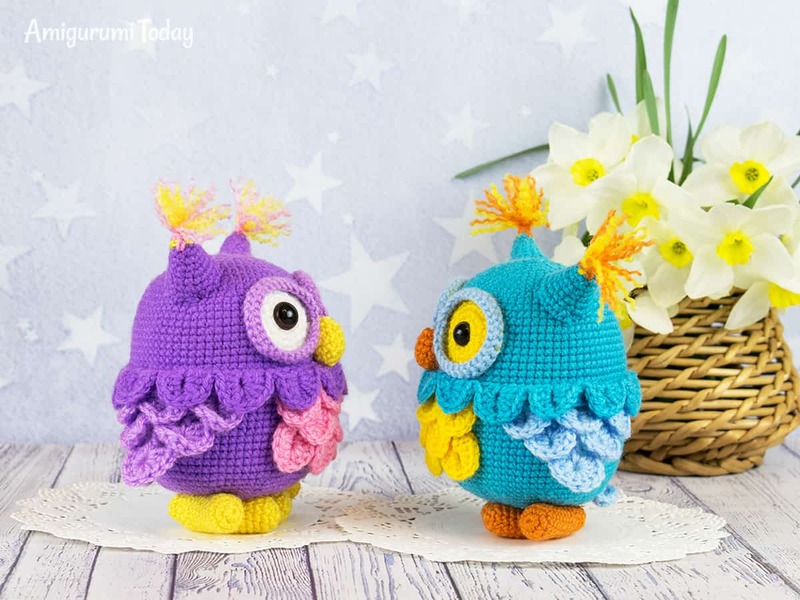 Make the next feather in the next pair of dc sts, crocheting 5 dc around each post of dc sts. Sl st in the next single dc. When working with the 3rd pair of dc st, crochet 5 dc around the post of first dc, turn, 4 dc around the post of the second dc, 3 ch and sl st in the center of the feather. Row 3: 3 ch (counted as dc st), 2 ch, 2 dc in sl st between the feathers, 2 ch, dc in the center of the feather, 2 ch, 2 dc in sl st between the feathers, 2 ch, dc in the center of the feather. Row 4: Work into the first pair of dc sts: 5 dc around each post of dc st. Sl st in the next single dc. Make the second feather in the same way. Sl st in the 3rd ch. Row 5: 3 ch (counted as dc st), dc in the same st where you made first ch, 2 ch, dc in the center of the feather, 2 ch, 2 dc in sl st between the feathers, 2 ch, dc in the center of the feather, 2 ch, 2 dc in the edge of the feather. Row 6: 3 ch (counted as dc st), 4 dc around the post of dc, turn and crochet 5 dc around the post of the next dc st. Sl st in the next single dc. Make the second feather in the next pair of dc sts, crocheting 5 dc around each post of dc sts. Sl st in the next single dc. Crochet 5 dc around one of the posts of third pair of dc sts, turn, 4 dc around 2nd post, 3 ch, sl st in the center of the last feather. The wings are crocheted from the bottom tips up. 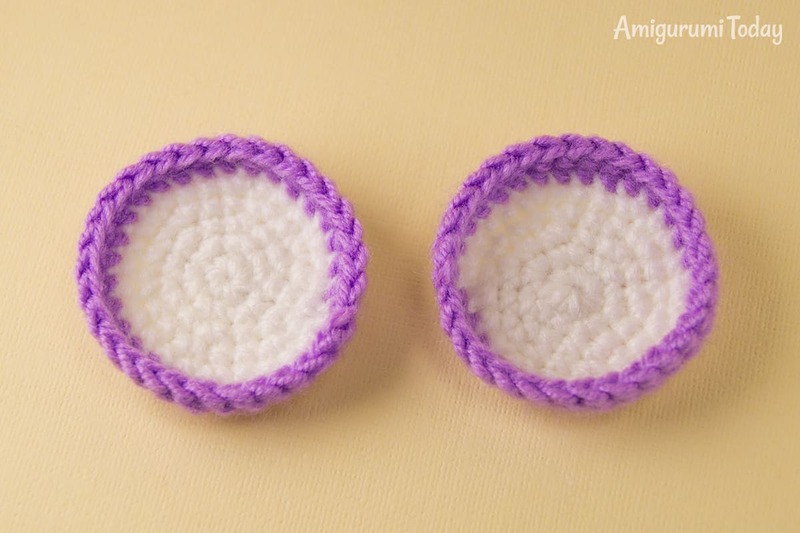 Crochet with light purple (*light blue) yarn 6 ch, join with sl st to make a circle. Row 1: 3 ch, 9 dc in the circle. The first feather is done. Row 2: 3 ch (counted as dc st), dc in the base of 1st ch, 2 ch, dc in the center of the feather, 2 ch, 2 dc in the edge of the feather. Row 3: 3 ch (counted as dc st), make 4 dc around the post of the 1st dc st, turn, 5 dc around the post of the 2nd dc st. Sl st in the next single dc. Make the second feather in the next pair of dc sts, crocheting 5 dc around each post of dc sts. Row 4: 3 ch (counted as dc st), dc in the base of 1st ch, 2 ch, dc in the center of the feather, 2 ch, 2 dc in sl st between the feathers, 2 ch, dc in the center of the feather, 2 ch, 2 dc in the edge of the feather. Row 5: 3 ch (counted as dc st), make 4 dc around the post of the 1st dc st, turn, 5 dc around the post of the 2nd dc st. Sl st in the next single dc. Make the second feather in the next pair of dc sts, crocheting 5 dc around each post of dc sts. Sl st in the next single dc. 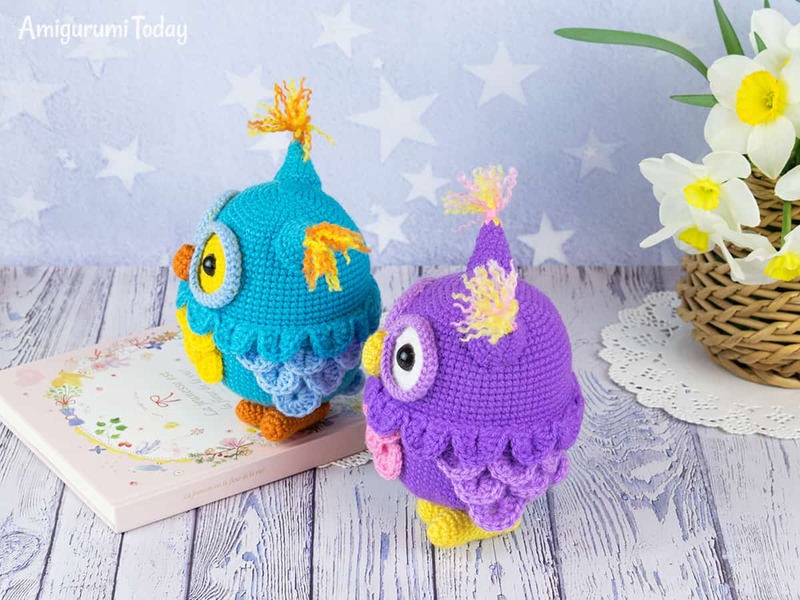 Make the third feather in the next pair of dc sts, crocheting 5 dc around each post of dc sts. 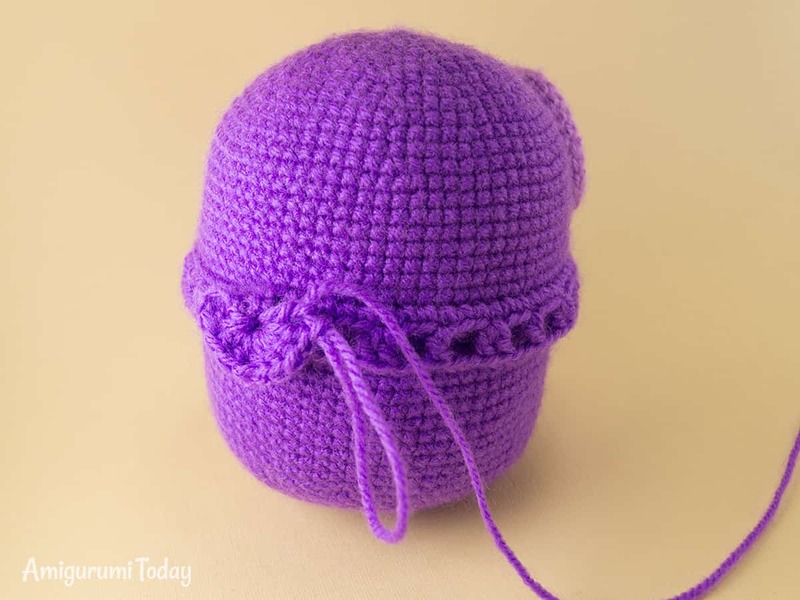 Join purple (*blue) yarn to one of the front loops of Rnd 22 of the head-body. Rnd 2: 3 ch (counted as dc st), 2 ch, (skip 2 st, dc in 3rd st, 2 ch, 2 dc in 3rd st, 2 ch) repeat 11 times, dc in 3rd st, 2 ch, sl st in 3rd ch at the beginning of the Rnd 2, 3 ch (counted as dc st), sl st in st where you started Rnd 2. Rnd 3: 3 ch (counted as dc st), make 4 dc around the post of the 1st dc st, turn, 5 dc around the post of the 2nd dc st. Sl st in the next single dc. (Crochet 5 dc around each post of dc pair, sl st in the next single dc) repeat 11 times. You will get 12 feathers in total. Don’t forget to fix the edge of the first feather in the end. Fasten off and hide the yarn tail. 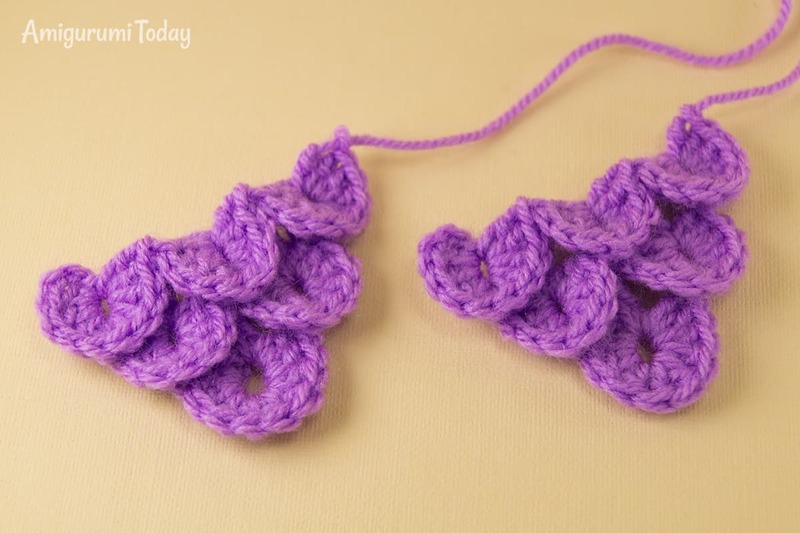 Crochet 6 ch with light purple (*light blue) yarn, join with sl st to make a circle, 3 ch, 9 dc in the circle. Crochet with yellow (*ginger) yarn. Fasten off leaving a tail for sewing. Stuff with fiberfill. Pass the yarn end through the front loops of the rest 6 stitches with your hook or sewing needle and pull to close the hole. Fasten off and weave in the end. 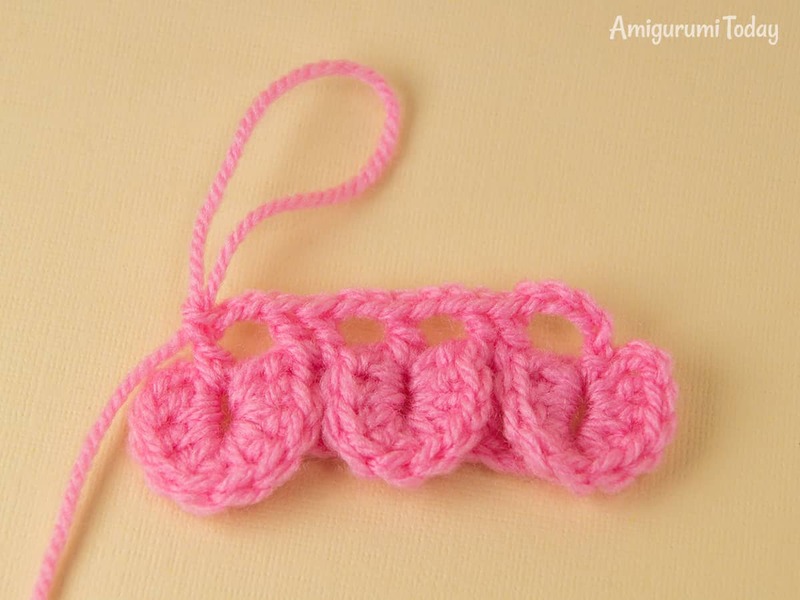 Crochet the second toe in the same way, but don’t fasten off. Put two toes together and crochet sc in next 3 st of both toes (through both layers). 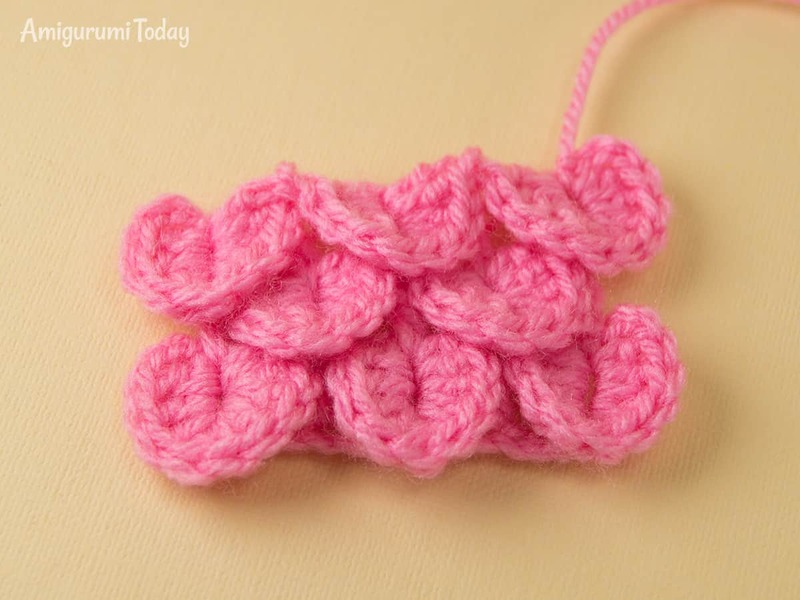 Continue crocheting in spiral rounds. Stuff the toes with fiberfill. Stuff the foot with fiberfill. Fasten off leaving a tail for sewing. Pass the yarn end through the front loops of the rest 6 stitches with your hook or sewing needle and pull to close the hole. 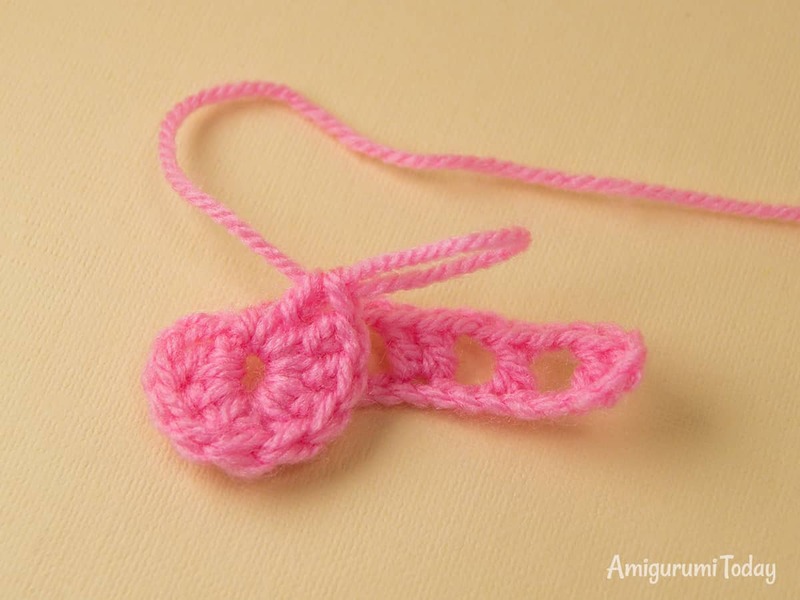 Draw the yarn tail out in the center of the foot with your hook. You will use this tail for sewing the foot to the body. Finish with sl st. Fasten off leaving a long tail for sewing. 1. Sew the chest feathers and the wings right under the neck feathers (the chest feathers are in the middle, and the wings are at the sides). 2. Sew on the tail at Rnds 39-40. 3. Sew ears to the head in between Rnds 6-13. Stuff them slightly before you finish. 4. Sew on the beak between the eyes. 5. Sew on the feet so that the owl could stand on its own. 6. 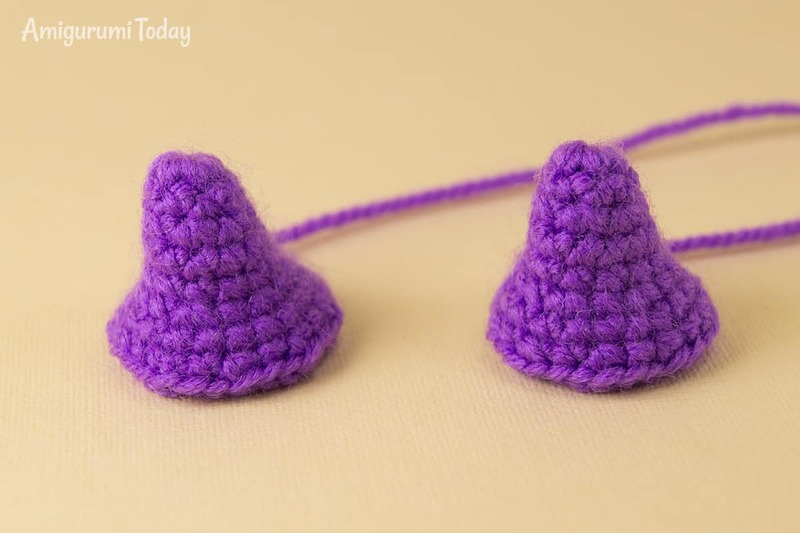 Decorate the ear tips with fringes made of pink (*ginger) and yellow yarn. Cut the yarn into pieces. 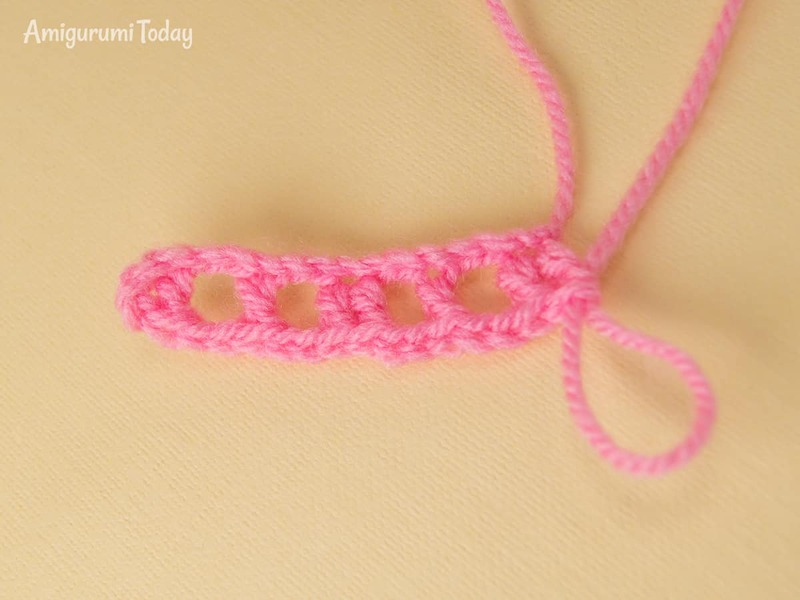 Fold the piece in half and draw its center through the stitch of the ear tip. Pick up 2 strands, draw them through the loop and tighten. Attach all other pieces in the same manner, then trim the fringes. Congrats! 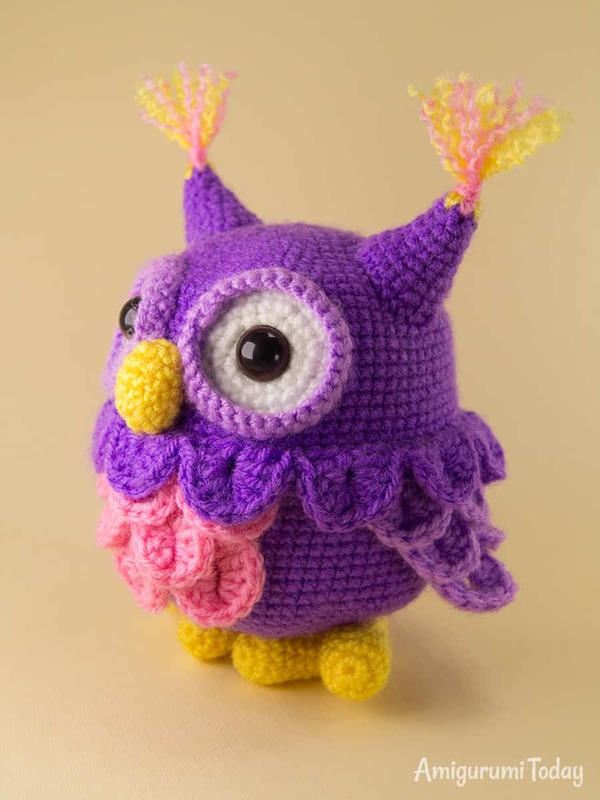 Your crochet owl is done! 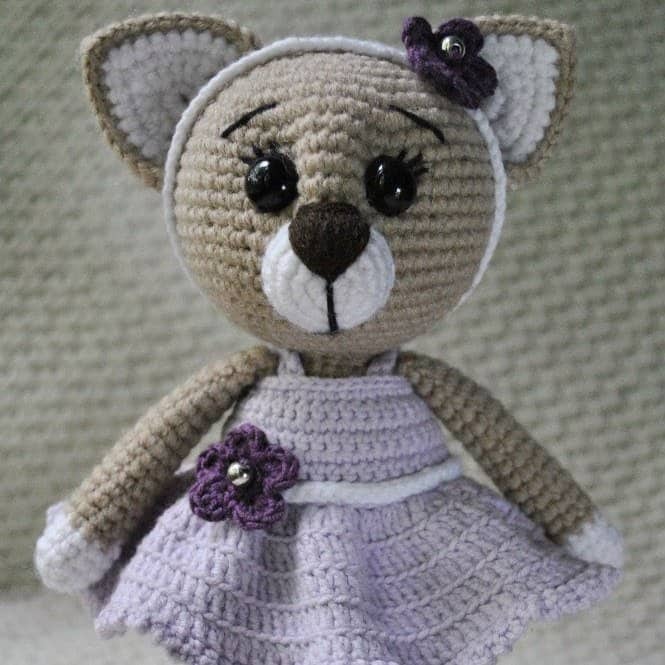 Share the pictures of your finished toys in our Facebook community. Someone please help me! I want to finish my owl but am stuck. I completed the neck feathers and then the next step is crochetng the feathers. I get stuck on the start of round 3…I’ve just about worn out my yarn from frogging it out over and over about 7 times already. I feel stupid because I usually don’t have this problem. I watched your one video on how to make the feathers but that isn’t from starting on the neck. I’m lost at the turn (?) not sure how to turn. The feathers on the neck are crocheted in the same way as other feathers. Please have a look at video tutorial. Je trouve votre site magnifique et m’y suis inscrite à l’instant. Je souhaite faire les hiboux, dont vous offrez le tuto,mais il est impossible de le télécharger, en français. Pouvez-vous m’indiquer comment faire, je suis désespérée. It is worked in continuous rounds. Hi there. 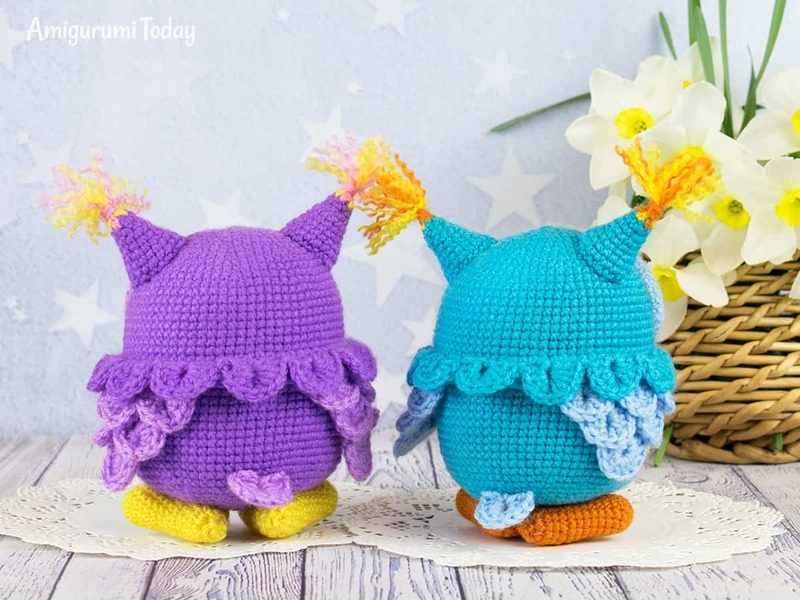 I entered my owl that used this pattern at my local craft show and won! 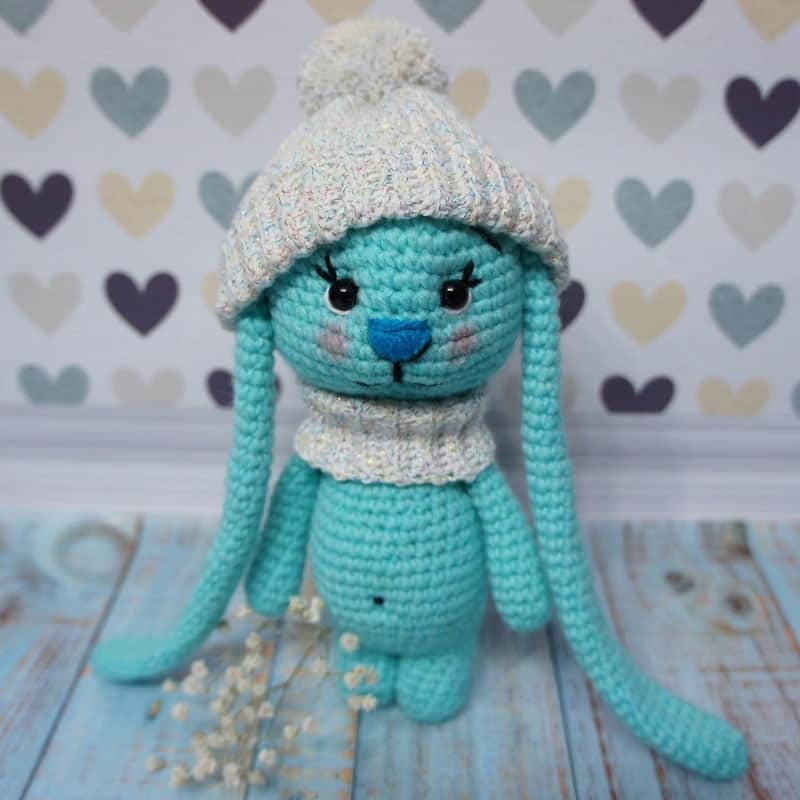 Thankyou so much for a great pattern! Could you please make a video tutorial for the neck feathers also? 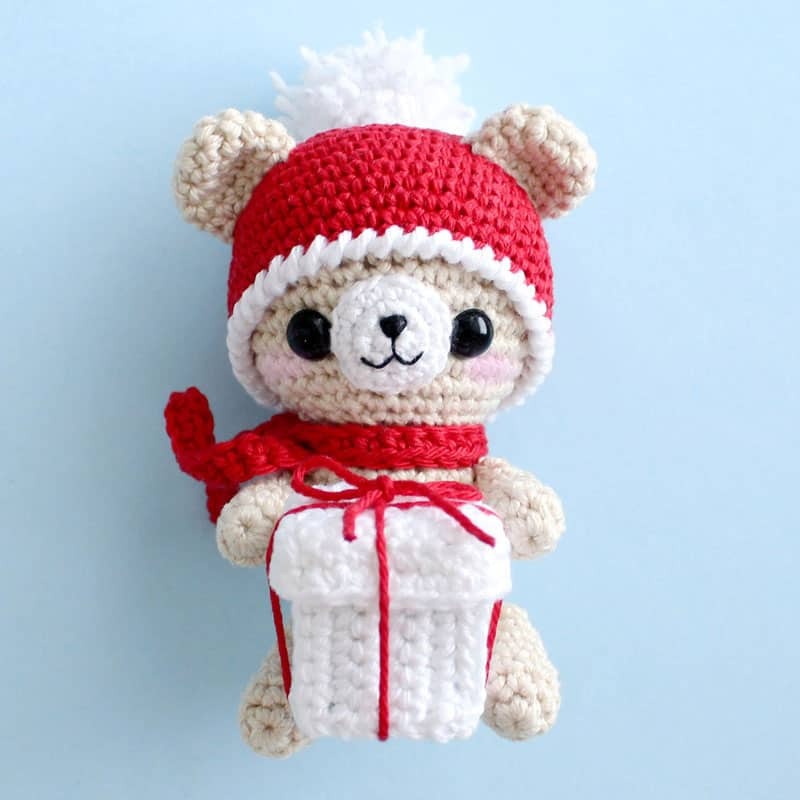 Cute pattern. Just wish it could be copied. OMG! These owls are sooo cute! I love your patterns.